In 2008 Compostmodern continued in the Morgan Auditorium and expanded its attendance to 600 people. The addition of moderator Joel Makower provided cohesion for the programming and expanded audience engagement. The 2008 event was produced by Gaby Brink and Phil Hamlett, and moderated by Joel Makower. Compostmodern 2008 was presented by the San Francisco chapter of AIGA and the AIGA Center for Sustainable Design (CFSD). The 2008 event examined the current and future potential for ecologically sustainable and socially responsible design, and focused on real world solutions and practical applications of design thinking. Compostmodern 2008 speakers demonstrated sustainability in action: Adam Werbach, a former Sierra Club president, outlined goundbreaking initiatives underway with his client Wal-Mart. Alex Steffen of Worldchanging described the urgent need for significant design solutions. Mark Galbraith from Nau Clothing outlined the unique retail model employed by this radical new clothing venture. Jean-Charles Boisset demonstrated how sustainability affects every facet of the wine industry. Jeff Walker from VSA Partners reviewed GE’s Ecomagination initiative and Scott Stowell from Open Studios provided insight into the editorial agenda of Good magazine. CFSD co-chairs Marc Alt and Phil Hamlett conducted a whiteboard session to flesh out specific strategic initiatives within the AIGA. Valerie Casey of IDEO introduced “The Designers Accord” a call to arms for the creative community to reduce the environmental impact caused by design. Jane Savage of Nike’s Considered Platform addressed their efforts to continually drive the use of more sustainable materials and design practices in Nike’s product development and Jacinta McCann of EDAW San Francisco detailed the impact of growing urban populations. GreenBiz editor and sustainability author Joel Makower presided over the day’s activities as emcee. More highlights can be found here. 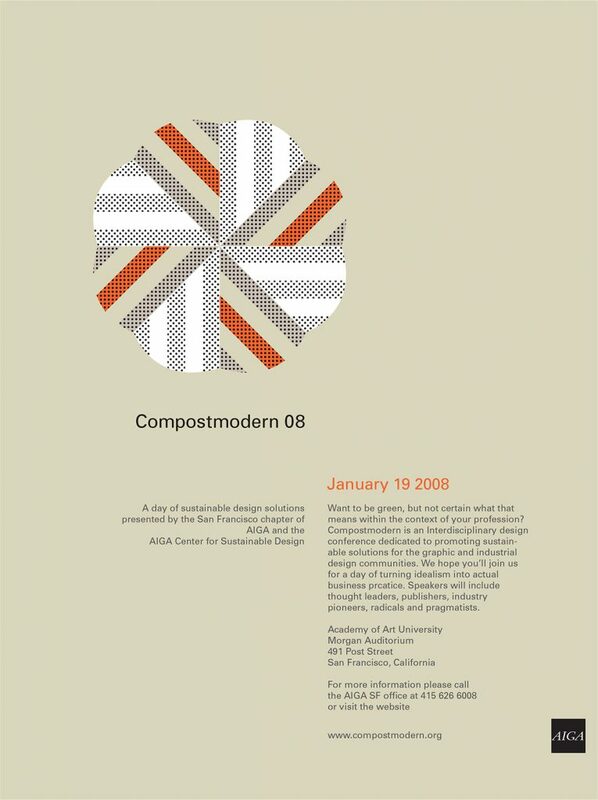 The presenting sponsors for Compostmodern 2008 were Adobe Systems Incorporated and Mohawk Fine Papers. Supporting sponsors included Addis Creson, Branch Home, Cheskin, Kashi, Lunar, Paragraphics/KBA and Tomorrow Partners. In-kind donations were provided by Cenveo Anderson Lithograph, the Academy of Art University, Boisset Family Estates, the Hotel Carlton and New Leaf Paper. Promotional considerations were made by Graphic Design USA, Good Magazine and Williams and House. Compostmodern 2008 creative development by Gary and Robert Williams.